The two fundamental elements common to all narrative – in paintings, text, movies, or computer games – are events and time. Whereas other articles in this series focus on the events depicted and those referred to, this article looks at time and its depiction. As a narrative medium, painting has a very limited range of tools and techniques for dealing with time. Language, in contrast, has rich and very precise mechanisms such as the tense of verbs, which in some languages can succinctly pin down exactly when, how long for, and how often something happened, without the need for any reference to exact dates and times, or external information. There are three aspects of time which are commonly required in narrative paintings. The most obvious is some means of telling the viewer when the event depicted in the painting happened. Also of importance to most narrative paintings is being able to show, or refer to, events which occurred in the narrative chain, before or after the event depicted in the painting. The final and less frequent requirement is to be able to refer to time as a concept, putting it in the vocabulary of the narrative painter. By definition, a static image in a painting refers to a moment in time, although including elements from different moments in time was not unusual in early European painting before the end of the Renaissance, and continues to be accepted in Indian painting. There are many ways in which the artist can place that moment: almost any painting outdoors in temperate climates will allow approximate location in time, through indicators of the seasons, time of day, etc. There are also techniques by which those general indications can be made more precise, such as the inclusion of a clockface, details which refer to specific events such as the passing of a comet (William Dyce’s Pegwell Bay, Kent – a Recollection of October 5th 1858 (c 1858) for example) or a forthcoming boxing match (Hogarth, below). William Hogarth (1697–1764), Four Times of the Day: Noon (1736), oil on canvas, 74.9 x 62.2 cm, the Ancaster Collection at Grimsthorpe Castle, Lincolnshire, England. Wikipedia. 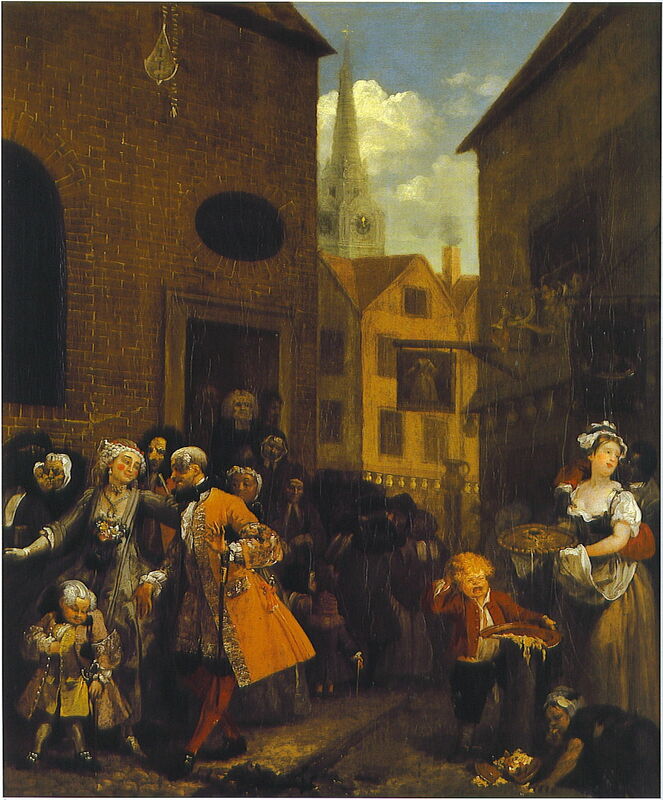 Hogarth’s Four Times of the Day: Noon (1736) provides many clues as to the season and time of day, but the most obvious and specific reference to time is provided by the clock on the church in the background. William Hogarth (1697–1764), The Second Stage of Cruelty: Coachman Beating a Fallen Horse (1751), line engraving on thick, white, smooth wove paper, 34.9 x 30.2 cm, Yale Center for British Art, New Haven, CT (Gift of Patricia Cornwell). Courtesy of Yale Center for British Art. 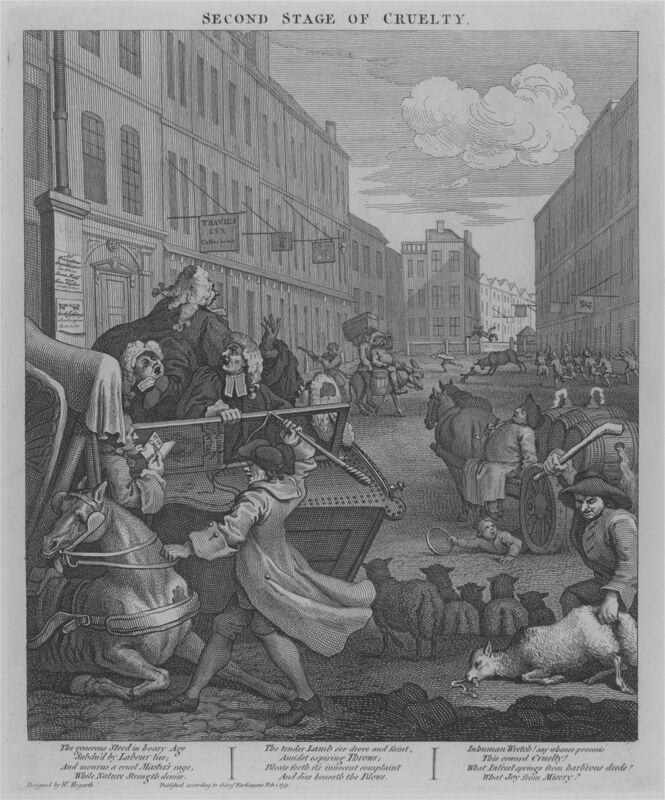 Hogarth’s Second Stage of Cruelty: Coachman Beating a Fallen Horse (1751) goes even further than is usual: posters by the door to Thavies Inn on the left advertise a cockfight, and a boxing match between James Field (who was hanged a couple of weeks before the first prints were issued) and George ‘The Barber’ Taylor, a previous English champion. For a painting to have complete and most effective narrative, references to events before the moment depicted in the painting, and to those in the future, are important; when an artist wishes to use the strong narrative of peripeteia, those references are essential. Generally speaking, these are achieved by including pictorial elements which are or make such references, as I exemplified when discussing peripeteia. There are occasional instances of flashback and flash-forward in paintings, but these are relatively rare compared with their use in text and movies. Édouard Detaille (1848–1912), Le Rêve (The Dream) (1888), oil on canvas, 300 x 400 cm, Musée d’Orsay, Paris. By Enmerkar, via Wikimedia Commons. 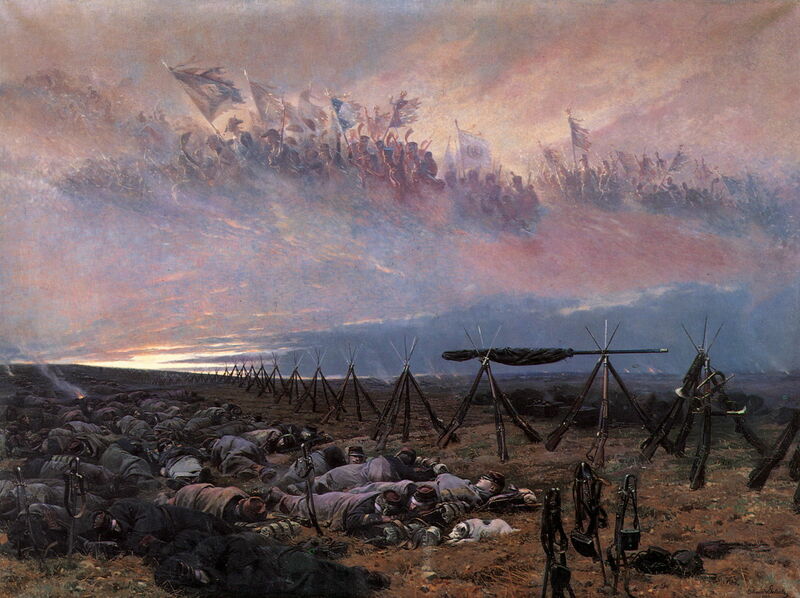 Detaille’s Le Rêve (The Dream) shows an (imaginary) collective dream of previous battles spread across the coloured clouds of the dawn sky, as a form of flashback. A traditional way in which to depict abstract concepts such as time in a painting was to refer to it by means of an allegory, as ‘Father Time’. Angelo Bronzino (1503–1572), An Allegory with Venus and Cupid (Allegory of Lust) (c 1545), oil on wood, 146.1 x 116.2 cm, The National Gallery, London. Wikimedia Commons. 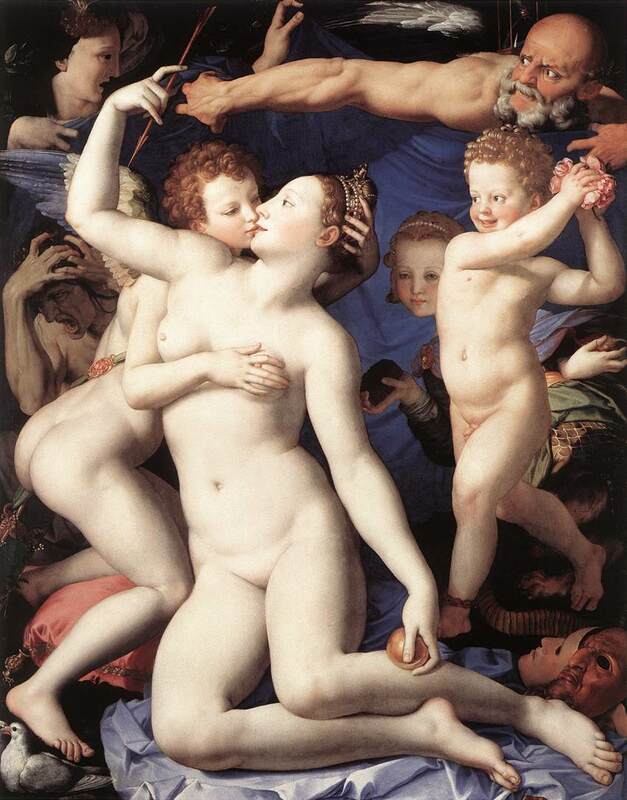 Bronzino’s An Allegory with Venus and Cupid (Allegory of Lust) (c 1545) puts Venus and Cupid at the centre, kissing, but above them is a bald old man with a white beard, stretching out his right arm across the top of the painting. Time’s characteristic ultramarine blue robe forms the background to the right side of the painting. Behind his head is the hour-glass which confirms that this is Father Time, and a grey wing, although it is harder to interpret his gesture. For the sake of completeness, the figure opposite Time is usually considered to be Oblivion. As is so often the case, it is Poussin who shows Father Time most clearly, in his brilliant A Dance to the Music of Time (c 1634-6). He sits at the right side, bald and bearded, now with very obvious wings, playing his lyre (another symbol of time), and his blue robe is on the ground. His hour-glass is being held up by the putto beside him. The four young people dancing are sometimes interpreted as being the seasons, but this is probably not the case: they are most likely Poverty (male at the back, facing away), Labour (closest to Time and looking at him), Wealth (in golden skirt and sandals, also looking at Time), and Pleasure (blue and red clothes) who fixes the viewer with a very knowing smile. Opposite Pleasure is a small herm of Janus, whose two faces look to the past and the future. Above them, in the heavens, Aurora (goddess of the dawn) precedes Apollo’s sun chariot, on which the large ring represents the Zodiac. Behind the chariot are the Hours. 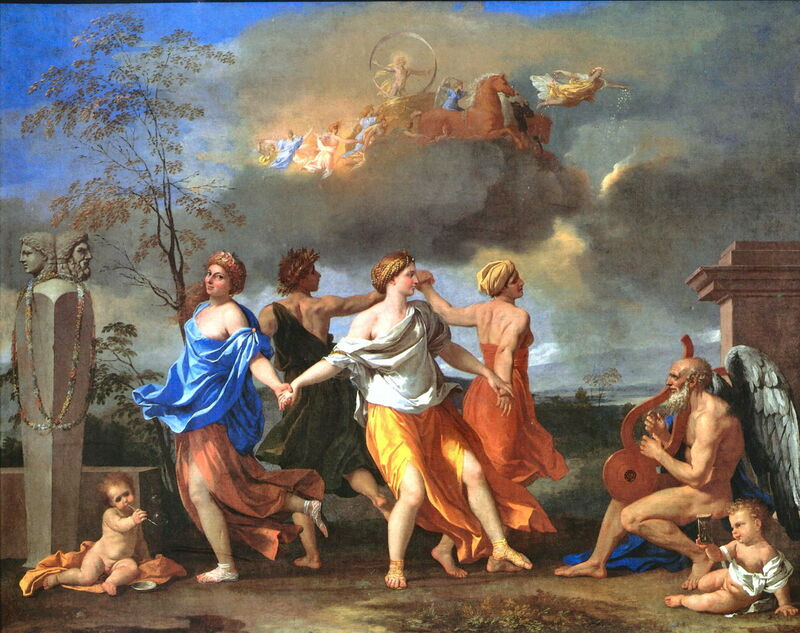 These classical projections, and something from the fire, suddenly suggested Poussin’s scene in which the Seasons, hand in hand and facing outward, tread in rhythm to the notes of the lyre that the winged and naked greybeard plays. The image of Time brought thoughts of mortality: of human beings, facing outward like the Seasons, moving hand in hand in intricate measure, stepping slowly, methodically sometimes a trifle awkwardly, in evolutions that take recognisable shape: or breaking into seemingly meaningless gyrations, while partners disappear only to reappear again, once more giving pattern to the spectacle: unable to control the melody, unable, perhaps, to control the steps of the dance. Nicolas Poussin (1594–1665), Time Defending Truth against the Attacks of Envy and Discord (1641), oil on canvas, diam 297 cm, Musée du Louvre, Paris. Wikimedia Commons. 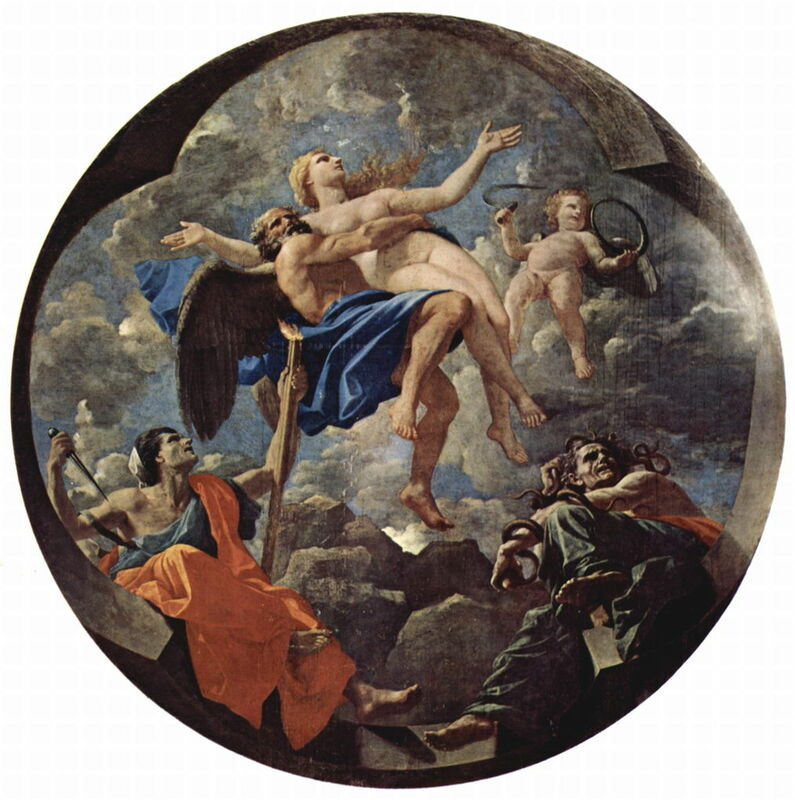 Poussin’s later tondo Time Defending Truth against the Attacks of Envy and Discord (1641) puts Father Time at its centre, with a firm grip around Truth’s waist, while Envy and Discord sit below them. On this occasion Time does not have a hand free for an hour-glass. 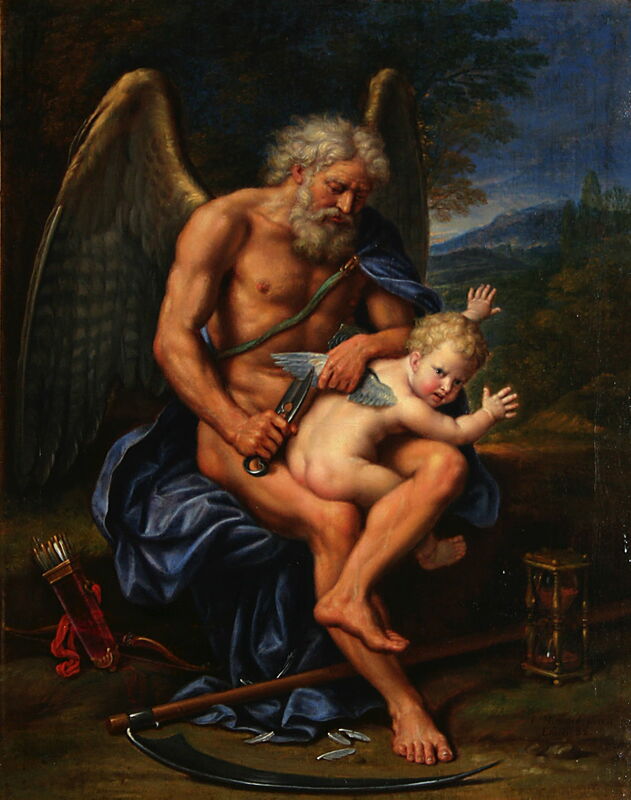 Pierre Mignard (1612–1695), Time Clipping Cupid’s Wings (1694), oil on canvas, 66 x 54 cm, Denver Art Museum, Denver, CO. Wikimedia Commons. Mignard’s lovely Time Clipping Cupid’s Wings (1694) is another very explicit allegorical painting featuring Father Time with his standard features, although here he has a luxuriant head of white hair instead of being bald, and has been equipped with a scythe (on the ground) rather than a lyre. Although we tend to associate scythes with the Grim Reaper of Death, they have also been used extensively for Death’s precursor, Time. Pompeo Girolamo Batoni (1708-1787), Time orders Old Age to destroy Beauty (c 1746), oil on canvas, 135.3 x 96.5 cm, The National Gallery, London. Wikimedia Commons. 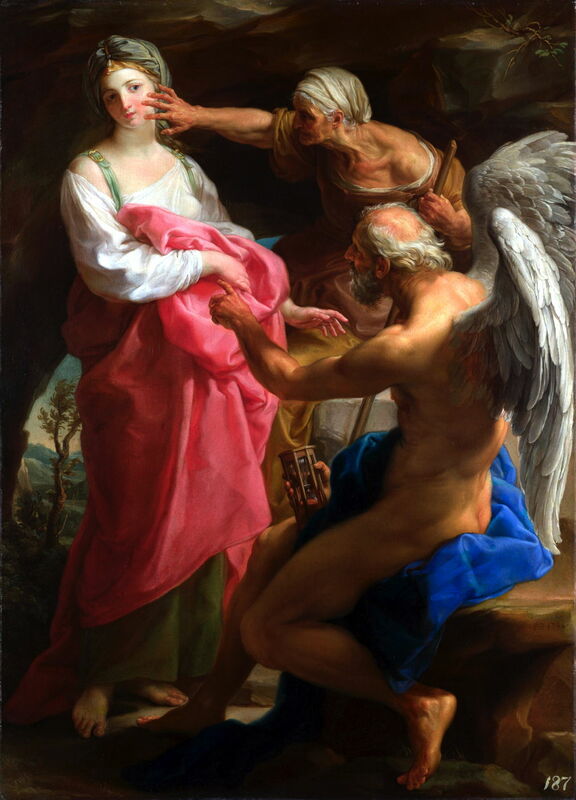 Finally, Batoni’s fine Time orders Old Age to destroy Beauty (c 1746) reiterates Father Time’s key features of advanced age, wings, blue robe, and hour-glass. Allegory is too blunt an instrument for a lot of narrative painting, where more subtle metaphors which can be worked into realist paintings are much more useful. I have not seen any discussion of this in the literature, but there is extensive and long evidence that one such metaphor is the thread of time, and the association of time with what are now called the fibrecrafts, particularly weaving and knitting. Of course thread is also used to refer to narrative itself, the thread of a story, which dates back to 1642. One ancient mythological reference to fibrecraft, life, and the thread of time is Penelope, the wife of Odysseus/Ulysses. In the many years that her husband was away on the Odyssey, she told potential suitors that she could not remarry until she had completed weaving a shroud for Odysseus’ father. 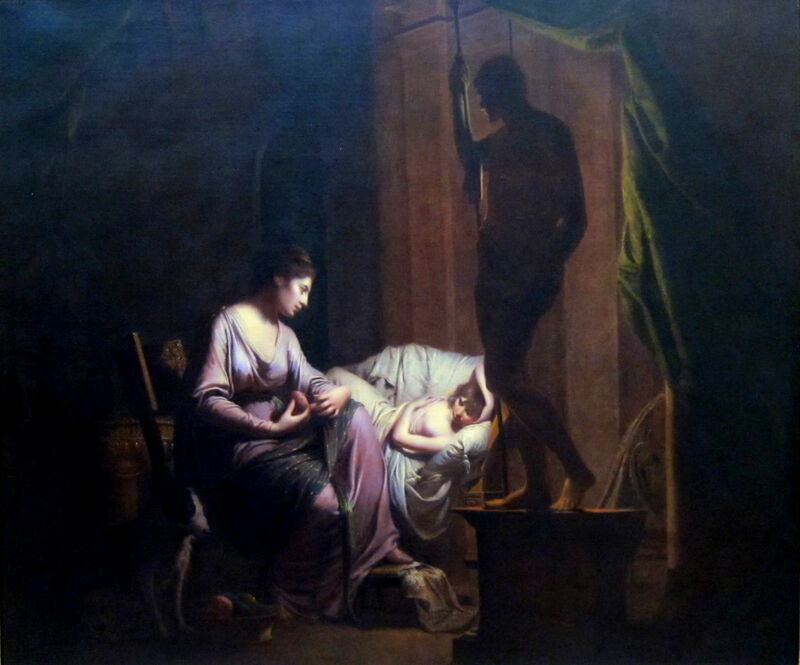 Although they saw her weaving intently by day, she then unravelled her work each night, as shown in Joseph Wright of Derby’s Penelope Unravelling her Web by Lamp-light (1785). 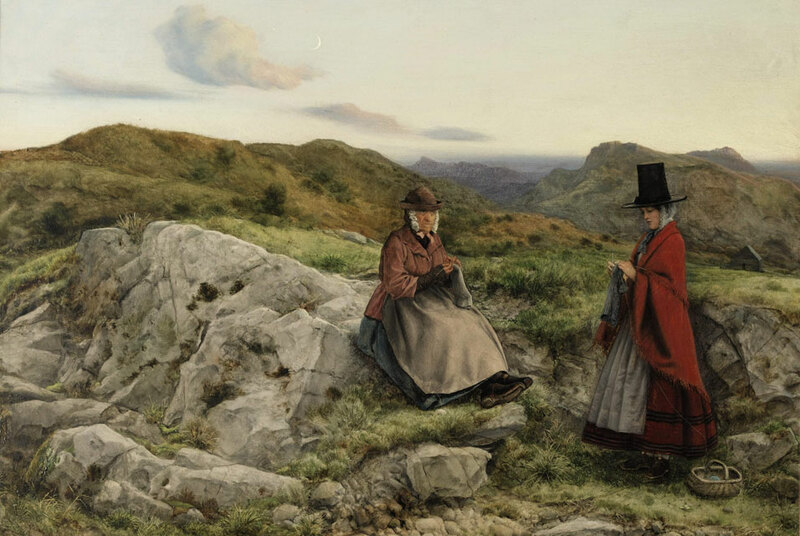 In William Dyce’s curious Welsh Landscape with Two Women Knitting (1860), I believe that the significance of their knitting is again as a representation of time. Frederic, Lord Leighton (1830–1896), Winding the Skein (c 1878), oil on canvas, 136.5 x 197.5 cm, Art Gallery of New South Wales, Sydney, Australia. Wikimedia Commons. 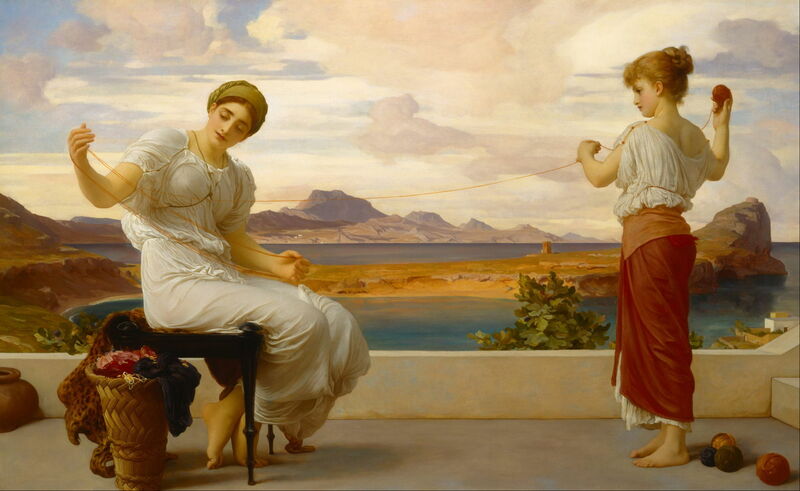 I also wrote that I considered Frederic, Lord Leighton’s Winding the Skein (c 1878) another example of the metaphor of the thread of time. 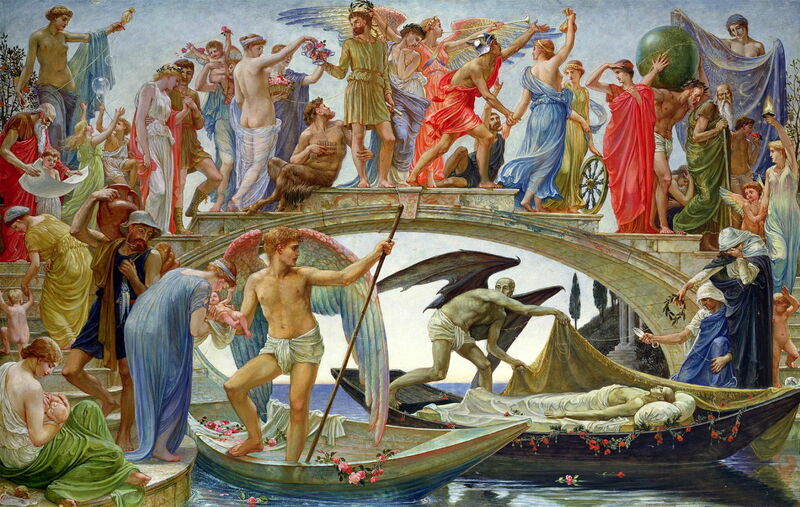 In Walter Crane’s The Bridge of Life (1884), the continuous white thread of life is also the thread of time. Even more explicit is this remarkable painting by John Melhuish Strudwick (1849–1935), a pupil of Burne-Jones of the Pre-Raphaelite Brotherhood. 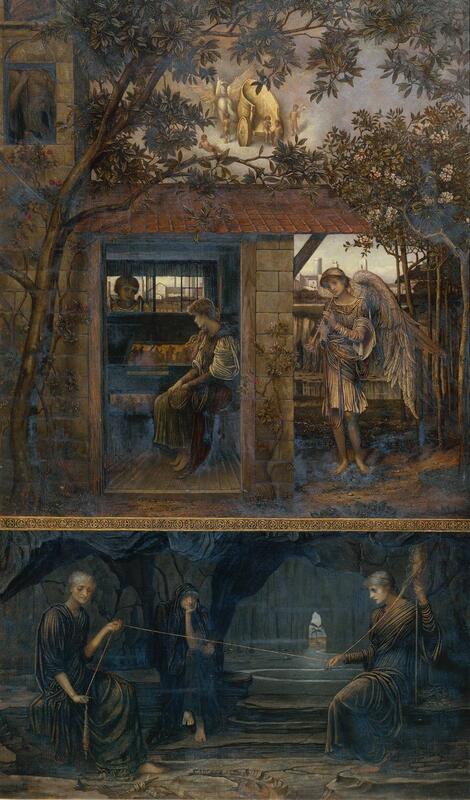 Strudwick has structured his painting into three areas. 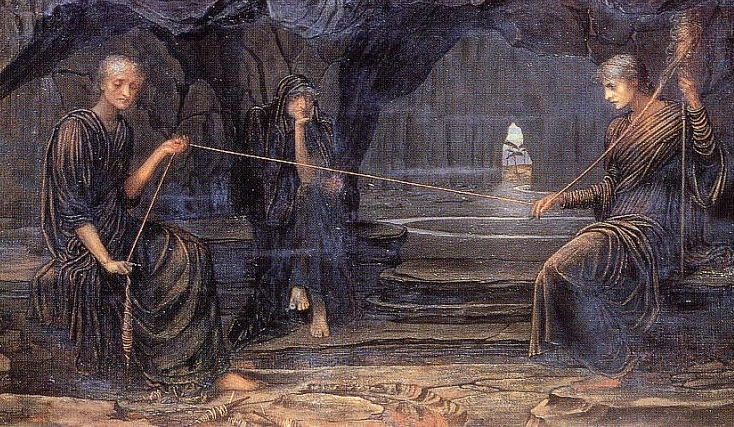 At the bottom, the three Fates from classical mythology are seen spinning the thread of life using gold and grey fibres, the gold section determining the allotted span of an individual’s life. These are shown in the detail below. John Melhuish Strudwick (1849–1935), A Golden Thread (detail) (1885), oil on canvas, 72.4 x 42.5 cm, The Tate Gallery, London. Wikimedia Commons. Above the Fates, a young couple are courting, time being marked by the tolling of the bell in the tower. At the top, Love’s chariot awaits them. 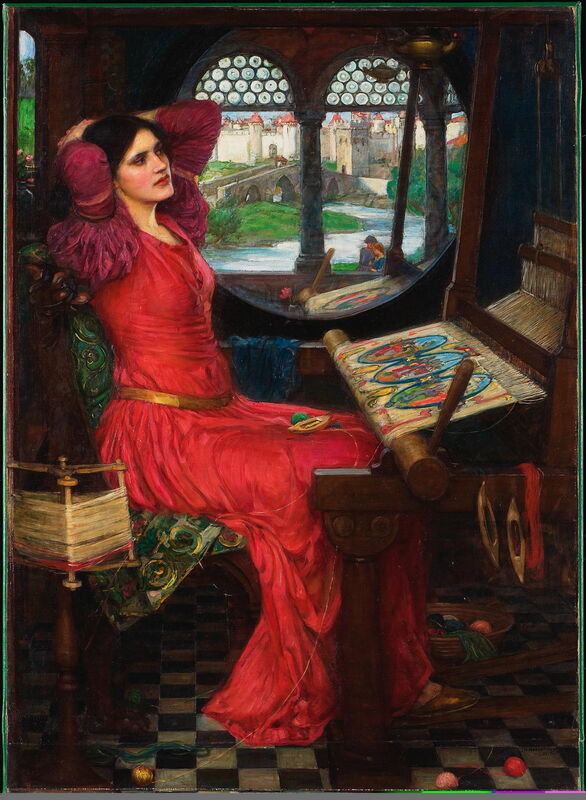 Tennyson’s Lady of Shalott also invokes fibrecraft as a metaphor for time. The Lady is subject to a mysterious curse which confines her to weaving images on her loom, and must not look directly at the outside world. As with most fibrecrafts, weaving is a time-consuming activity which is often seen as occupying time in a useful and productive way, working with the thread of time. At first sight, narratives in painting might appear severely constrained in expressing time, in comparison with the riches of language. Although limited, painting has developed some subtle tools for fixing the moment in time, for referring to prior and later events in the narrative, and for discussing time itself – provided that we recognise them. Posted in General, Language, Painting and tagged allegory, Father Time, fibrecraft, Flashback, knitting, metaphor, narrative, painting, peripeteia, Poussin, thread, time, weaving. Bookmark the permalink.